I've recently done yet another significant upgrade to Ham Finder, and I thought I'd let you all in as to what's changed with the latest version, and give you a sneak peak as to what will be changing soon. 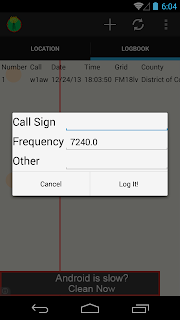 The biggest difference with the newest build is that I've started to work on the Log Book to make it more user friendly. It still has some work to be done, but it's definitely a step in the right direction compared to what it used to be. 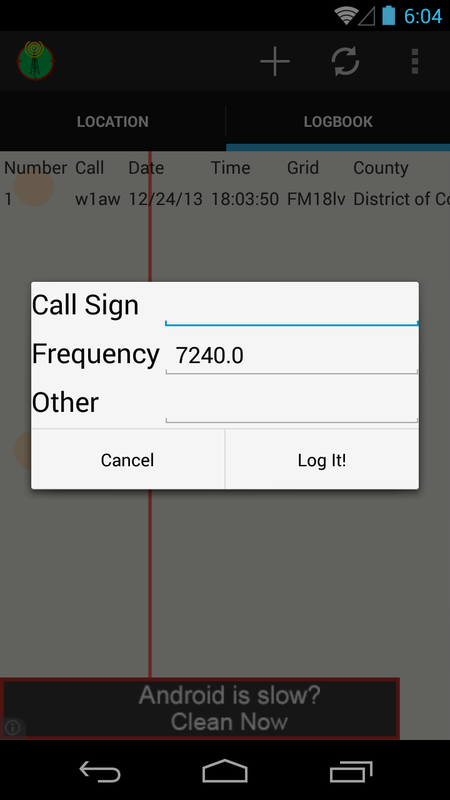 The input dialog is still the same, just the user's call sign, frequency you made the contact, and a field for what you entered. Now compared to previous versions, you can actually see all of the fields entered. Also, there is now a tab selection mode, which will easily allow you to switch between the location and logbook, and any future mode which may exist. Future versions will continue to improve on this. One of the features I'm working on right now will allow for user customization, including selecting which columns will appear, and in which order. In addition, the app will be better formatted for Tablets, as things are right now, it looks poor on a 7 inch tablet, and even worse on a 10 inch tablet. There was a major redesign in the code to allow for making a tablet version of the app easier. I am excited to announce the release of Ham Finder 1.1. There's a lot of goodies in this new build, and I hope you'll find them as useful as I have! The biggest new feature is the ability to buy add on products. For right now, there are just two available products, but I hope to have many of them available soon. The two ones now are a general upgrade to remove ads, and a complete offline database of all US counties. 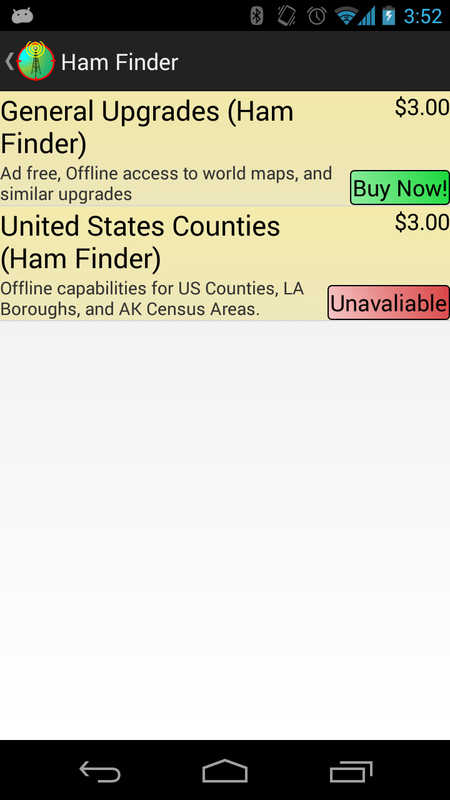 With the offline database, you can figure out what county you are in even without an internet connection! There are also a lot of little features in this build, like improved Holo support, better popups, cleaner displays, and overall better performance. I really hope this will make an improvement in the lives of those who purchase it!